Innovation - CPoR devises has launched a range of mini gold bars, called « lingotins »! CPoR devises has launched a range of mini gold bars, called « lingotins »! 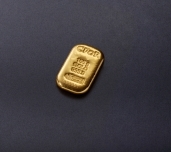 CPoR Devises designed a product for individuals, interested in buying gold bar but without necessarily affording to buy it. It must be said that gold bar price now exceeds € 30 000, driven up by economic uncertainty and currency volatility. Historical safe investment, gold price almost doubles in two years "thanks" to the financial and economic crisis, to reach a new historic level, $1,424.01 an ounce, at the beginning of the month. First market participant for physical gold in France, this credit institution - 20% owned by Credit Agricole SA - has recently launched on the French market a range of 999.9 per thousandth of fine gold with weights ranging from 50 grams to 500 grams. The smallest of them is currently priced around €1700. Manufactured by the Swiss group MKS, a Geneva’s smelter and refiner, all of these mini bars are numbered, delivered with dedicated test report and listed and priced daily. Their listing is also available on CPoR Devises website, which, since the end of the official listing of gold at the Paris exchange in 2004, provides everyday at 1pm the listing of twenty products most commonly traded in France: 1kg ingot, Napoleon, but also foreign coins such as 20 Swiss Francs, the Sovereign English, the Mexican Peso or the South African Krugerrand. Beyond the willingness to take advantage of individuals current craze for demand of gold, the aim of such a product is primarily the expansion of existing offers, "there was nothing between the largest gold coin of 50 Spanish pesos that contains 44 grams of gold and current gold bar that contains 1000"specifies CPoR Devises. Even if the "lingotins" are a good compromise between coins and gold bars, one can wonder if it is not easier for investor to turn to "paper gold" through the use of listed index fund tracking gold prices. Nevertheless, current economic uncertainties seem to encourage individuals to buy and hold physical gold as a safe savings. This might explain the initiative of CPoR Devises.